Have you noticed that I love hems? I mean really really love hems. Folded hems, picot hems, garter, lace, matching or contrasting. I think they add such a nice finishing touch to garments, even heavier weighted garments in thicker yarn, which can benefit from a hem to weight down the bottoms or add just a touch of whimsy. Or ethereally light lacy hems, simple double hems to keep a garment's edges from stretching. 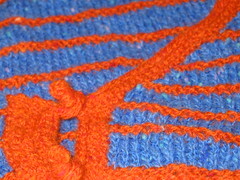 I even figured out a way to knit both sides of a hem at once so as not to have to sew one side I love them so much. This is just a simple hem though. Hardly complex, but just enough to give the edges some structure with an icord around. Worthwhile I think, even if you don't like picking up stitches. Like many things, hems require good shaping, often shortrows (which are rarely written in to patterns, especially for cabled edges- or the pattern doesn't have curvy edges because of this. They *are* a pain to write out!) 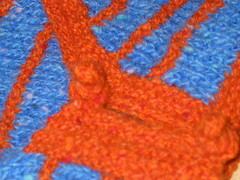 or increases and decreases to help the edging turn a corner smoothly, draw in a cuff, or create a collar.